Hunt for the Treasure Dragon's Egg! Pirates have stolen the Most Valuable Treasure of all! The Treasure Dragons have long been revered by the people of (and off the coast of!) Terra Lacuna. Tragedy has struck the area, with the theft of the Lord of the Treasure Dragons' heir! 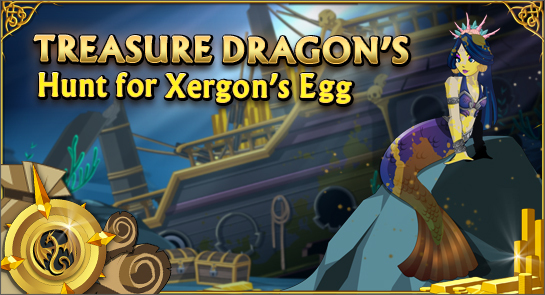 Chrysos, Lord of the Treasure Dragons, will NOT be pleased that pirates have stolen Xergon's Egg. His heir isn't even hatched yet and he's already getting into trouble! DragonMaster AuScythe was supposed to be looking after Xergon, but the Pirates managed to steal away the egg from underneath his nose! Phione - one of the mermaids living off the coast of Terra Lacuna - spotted the pirates who stole the artifact from Chrysos, Lord of the Treasure Dragons. YOU are going to need to get his treasure back... before it's too late for the entire Treasure Dragon race! But beware - the protective curse-magics surrounding this artifact are strong - you can see how they've begun affecting Phione, slowly turning her and anyone nearby to gold. While you're battling to take down the thieves and recover the artifact without being gilded yourself, keep an eye out for the deadly creatures of the deep! You never know what you'll find in the depths!